Roxy Walsh’s work does not want to be pinned down or completely understood and described. There is always the sense of something or someone hiding. It holds secrets that do not want to be guessed, although it doesn’t mind you looking and having a go. They are fleeting moments too, like kingfishers ‘usually seen when they have just gone’. 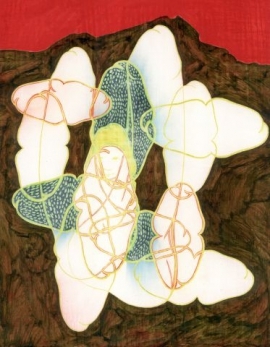 [i] She hints at ideas and meaning in her catalogue with texts related to the images of the work, but then you realize that these were pieces of writing by others, which may have been chosen before or after painting and may either elucidate or give camouflage. The relationship between word and image is raised by Two Tongues Tied. It was a happy chance for me that Making Visible, the comprehensive Paul Klee exhibition at Tate Modern, and Roxy Walsh’s show Two Tongues Tied at The Leyden Gallery ended on the same weekend, in that I saw them consecutively. I knew after seeing the Klee that I didn’t want to see anything else in between, but keep the clarity of colour, the calm sure confidence and trust in the intuitive alive in my mind to take to Roxy Walsh’s show. There aren’t many artists who could have that conversation with him on anything approaching equal terms. But Walsh and Klee share a sense of humour; the love of watercolour, its ability to stay fresh and alive with wash upon wash; also the use of varied surfaces, using gesso, panels and linen to work on. They both hint at figures in an apparently flat space that suddenly recedes with deep blues and blacks or jumps forward with reds and oranges. Roxy Walsh uses more contemporary colours with fluorescent yellows and metallic paints that inhabit liminal spaces, but then I remember Paul Klee’s Overture 1922 with its gold strip down the centre creating an entirely different ground. A flattened sideways figure, only apparently able to move in two dimensions along the canvas, and what may be empty speech bubbles crop up many times in this show. 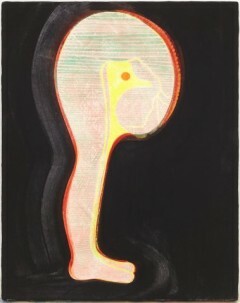 Arch (2011) was the first in what became a series, she describes this painting as ‘the question which all the others try to answer’. [ii] It is a soft delineation of a woman bending over and I see the Ancient Egyptian sky goddess Nut – with her high curving back, her entire body arching over her brother-lover Geb the earth – passive but at work holding everything together. These two were held apart by Shu, their father, emptiness. Later I discover that Roxy had spent ten weeks in Egypt in the year before graduation, and I recognise many influences: the flattened space, painting on plaster, hieroglyphic motifs and the desire for words alongside painting. Perhaps a counterpart to Arch appears in the small engaging work: We Gave Them Stones (2003). This was painted during the search in Afghanistan for Osama Bin Laden, thought to be hiding in caves there. Here little figures hide in an earthy den of red and burnt umber. They look like bound double-headed penises, ‘not strong love-rod phalluses’ she says but soft and tender and vulnerable. [iii] And earth-bound Geb is sometimes depicted with an erect phallus trying to reach and reconnect with his lover-sister sky. In Second Skin (2012) the pale blue figure slightly faces us and sheds a bright red cloak or veil. I comment that she has a little more depth to move in, Roxy says: ‘about three inches’. We talk about process in this painting. She applies gesso to the linen or panels which she sands down and recoats eight times before starting to paint. The watercolour paints she uses can be washed off and reapplied many times. Some colours such as green gold stain the surface, adding another depth to the layers. She says ‘The paintings are slow to make but the events are not slow and combine accident and purposefulness.’[iv] She works at different speeds applying the paint sometimes as a sticky substance, or wet paint upon wet, or as thin living washes which run and move into each other and separate and merge. In some paintings such as Scare Quotes (2012) the passive figure comes to life with cheeky subversive actions using a similar language to cartoons: the body farting or peeing with the bubbles mutating into heads or milk and blood, or tears. In Ostrich (2012) she has her head buried in a deep dark hole, but although she can’t see, because of the dissected nature of the image, (like the ant nests or bee hives behind glass in a museum) we can see her not thinking the unthinkable, but unthinking the thinkable in an attempt perhaps to bear the unbearable. The speech bubbles become quotation marks. And speech – the voice – things said – or unsaid– are a fundamental part of Roxy Walsh’s relationship to imagery. She relishes the close relationship of hieroglyphs and image on Egyptian sarcophagi, but her Two Tongues Tied figures are mute, words perhaps being futile to express certain things (and hieroglyphics were only understood by the priesthood). So it was a relief to see legible words in the latest work, tiny detailed “Rue St Denis” (2013). 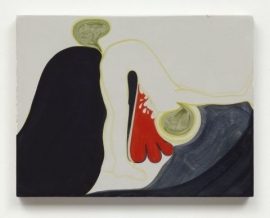 Roxy Walsh Two Tongues Tied was at Leyden Gallery, 9 Leyden Street London E1 5 February to 8 March 2014. [ii] In conversation March 9 2014 for this and further quotations.